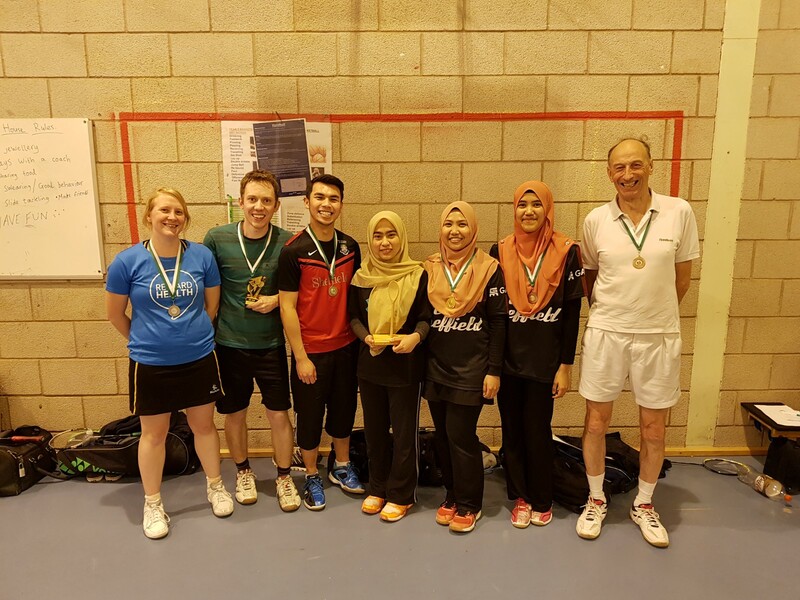 Well, it was another great club tournament this year, which was held on Tuesday 19th March. There were a lot of close games, and good spirits all round. Thank you to all those that attended and made it such a great night! You’ll be pleased to hear that from tonight, we resume our club night session schedule. This means that there’ll be a club night every Tuesday and Friday from 7pm to 10pm until the Christmas break. Another great tournament last night, with 26 hopefuls battling it out to be crowned the 2018 champion. The 2017/18 season has now begun and so we’re back running two club nights per week! These are on Tuesdays and Fridays from 7pm until 10pm, and provide a great opportunity for practice and a catch-up. Join us at Oakbrook Badminton Club, King Edward VII Lower School, S10 5RG – See the Contact / Directions page for more details. All existing and new members welcome! Come down from Tuesday 20th June to enjoy our summer badminton club. Existing and new members welcome; only £3 a session. Runs every Tuesday until the end of August, from 7:45pm to 10pm. Thank you to all of those that attended! It was another fun and enjoyable night with lots of good games! Please find the winner results of the tournament below. The wooden spoon was won by Morag! Click here for the full results to find out how you got on! Thanks again, and I hope you’re all looking forward to the tournament next year. The 2016/17 season has now begun and so we’re back running two club nights per week! These are on Tuesdays and Fridays from 7pm until 10pm and provide a great opportunity for practice and a catch-up. So join us over at Oakbrook Badminton Club at King Edward VII Lower School, S10 5RG – See the Contact / Directions page for more details. This years summer badminton will be starting on Tuesday 7th June. Sessions will run from 19:45 until 22:00 every Tuesday until the new season starts in September. The prices will remain the same as previous years; £25 for a lump sum or £3 per session paid on the night. Whether you’re a new or existing member, please come down; we’d love to see you! Please find the results of the Oakbrook badminton tournament below. Thank you to all of those that attended! It was another fun and enjoyable night with lots of close games! 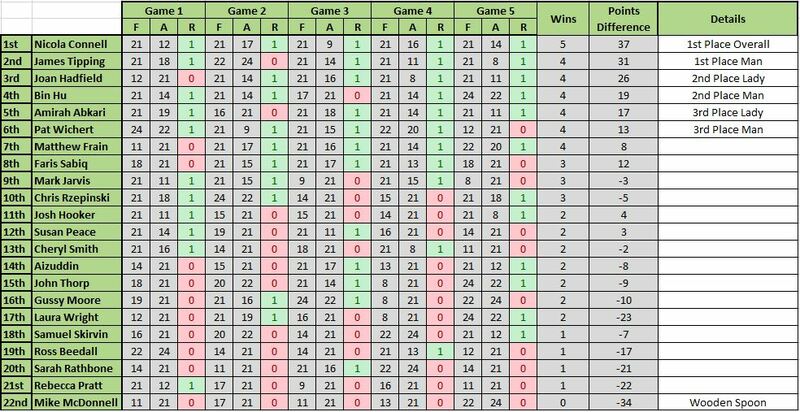 For the stat lovers out there, 17 out of the 24 players that took part ended up with a points difference of +/- 10 or less, and nearly half of the games played ended up with just 2 points difference. A big congratulations to the overall winner Sufi, who went undefeated over the evening.